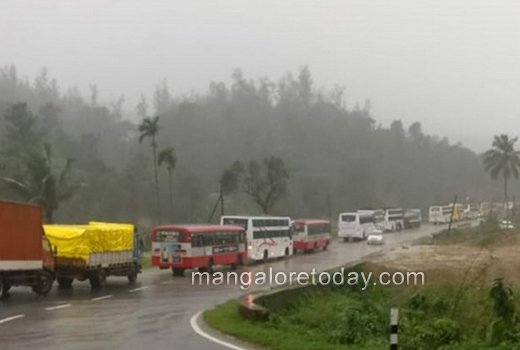 Mangaluru, Aug 14, 2018: Heavy rains have resulted in landslide and have also uprooted trees at Doddathoppe near Maranahalli on Shiradi Ghat leaving over 300 vehicles including buses and lorries stranded since Monday night. The administration has initiated measures to clear the road of soil as well as trees. It has been gathered that landslides have taken place in at least three places from near the shrine at Gundya border. Several passengers in the buses are hit hard and many were seen walking towards Gundya and Nelyadi which are around five to six kms away.